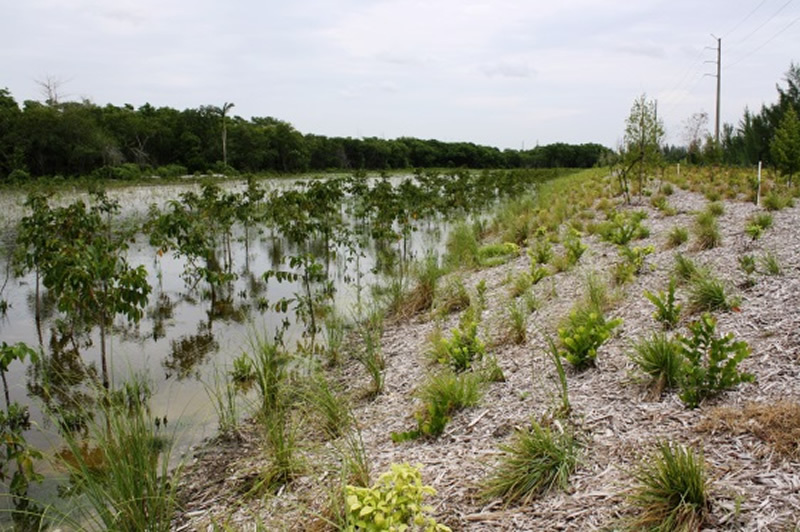 The team of Everglades Restoration & Land Clearing, Inc. (ERLC) and Aquatic Vegetation Control, Inc. (AVC) provided a “turnkey” mitigation construction and maintenance project for Stantec Consultants. 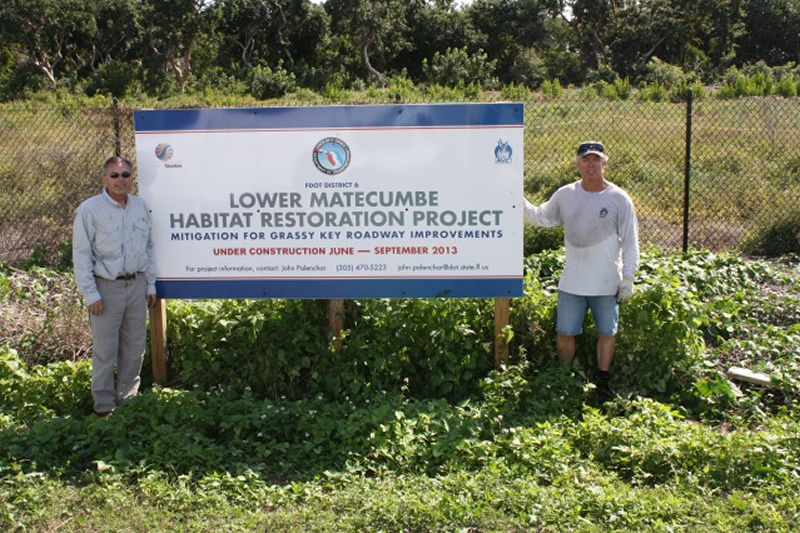 Project Size: 56,000 native plants in a 7.27 acre mangrove and pond apple mitigation area with an adjacent 1.6 acre upland/wetland buffer. 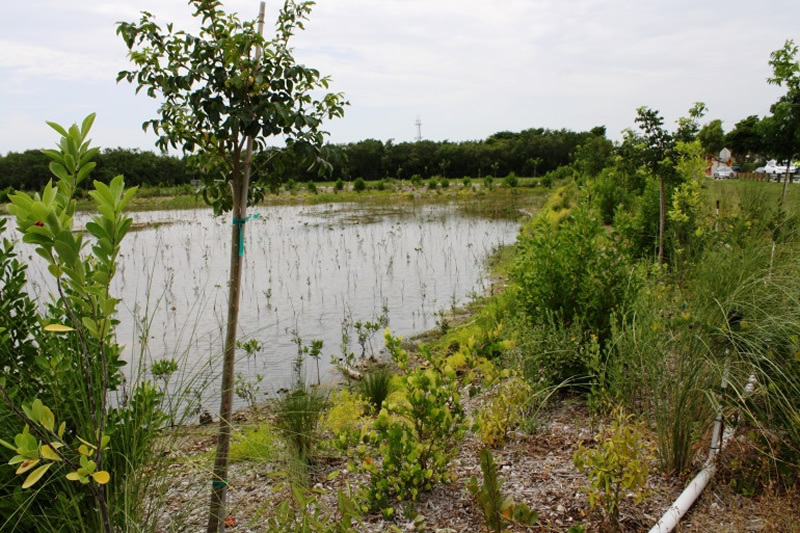 Project Purpose: The mitigation site was constructed for off-site mangrove mitigation for I-595, I-95 and future FDOT transportation projects within Broward County. Permit: SFWMD and USACE Environmental Resource Permit and Dredge and Fill Permit. Everglades Restoration & Land Clearing (ERLC) began this project with the installation of FDOT silt fencing and floating turbidity barrier which were maintained for the duration of the project. In efforts to construct the 8.87 acre mitigation site ERLC removed all existing invasive vegetation throughout the site. ERLC excavated and hauled nearly 80,000 cubic yards of soils, some of which was used to fill an existing canal on site while the remainder was hauled off site. Working in conjunction with Stantec, ERLC provided solutions to problematic site conditions such as the presence of heavy clay soils and buried debris. To achieve final grade in preparation for plant installation, EGWRS imported and installed 12,000 cubic yards of organic muck and planting soil. Aquatic Vegetation Control, Inc. (AVC) planted the 8.87 acre mitigation site with 56,000 plants according to the as built survey. The Stantec/AVC team worked together to maximize the amount of mitigation credits. The plantings ranged from 1 gallon to 45 gallon material grown at the AVC nursery (Martin County Farms) and other partner nurseries. Temporary irrigation and mulch were installed in the 1.6 acre upland buffer. The project was maintained by AVC to insure a successful outcome. In an effort to utilize an existing resource present throughout the site, the ERLC/AVC team developed a plan to process the Australian pines slated for removal to yield high quality mulch in an environmentally sound way. Australian pine mulch is sold commercially in Florida and processed properly is a good source of hardwood mulch. The process eliminated the need to send hundreds of heavy trucks consuming gallons of fuel and creating a significant carbon footprint. The Australian pine logs were separated from their stumps and all other cleared material including, but not limited to, Brazilian pepper. The clean Australian pine logs were processed through a large tub grinder until the proper mulch size for optimum distribution and coverage was achieved. The mulch pile was placed in a staging area onsite to “cook” for two to three months. The pile was turned as appropriate to yield sterile mulch. There has been no regrowth of the Australian pines. The Pond Apple Slough mitigation area was maintained by AVC per the contract requirements leaving no risk to FDOT or Broward County. We Serve clients throughout southeast Florida including West Palm Beach, Palm Beach, Delray Beach, Boynton Beach, Boca Raton, Port St. Lucie, Lake Worth, Wellington, Riviera Beach, Palm Beach Gardens, Fort Pierce, Vero Beach, Jupiter Island, North Palm Beach, Lake Park, Stuart, Palm City , Jensen Beach and surrounding areas.